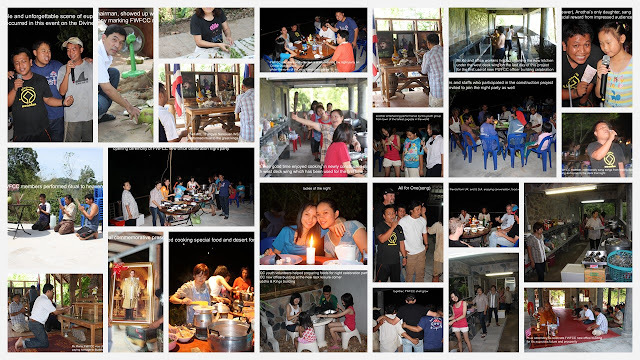 During October 24 -25, 2010, FWFCC welcomed team members of the”Fly 150 Club”, who traveled from Bangkok with their motorbikes and spent a night in tents on “The Divine Dodge Deck”, at our Huai Khayeng office, Thong Pha Phum, Kanchanaburi. 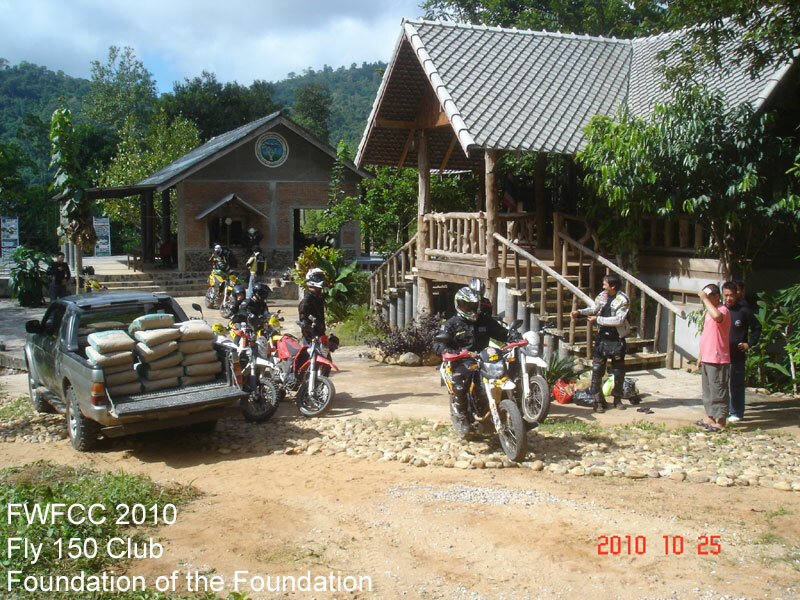 The “Fly 150 Club” is a group of philanthropists which vary in age and career, traveling by motorbikes from place to place to free their spirits & desires. They enjoy their lives by riding and by making donations to social & public organizations along their touring routes. Thanks to Mr.Kulphak and all members of the “Fly 150 Club” for their donation of 16 sacks of cement to support the on-going facilities construction projects of FWFCC. 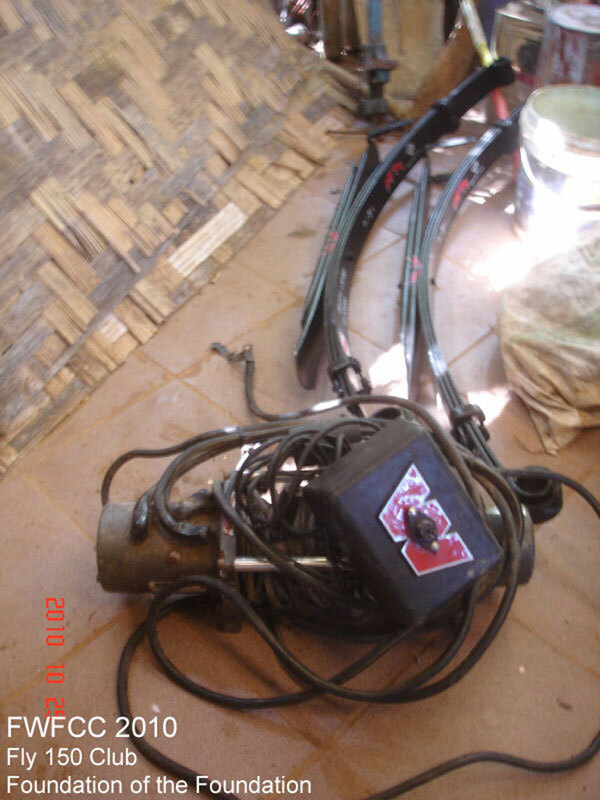 Also a big thank you for the donated electric winch, (Warn 9600), an extremely important piece of equipment, which will support FWFCC in-field conservation projects in the World Heritage Forest & the Western Forest Complex. 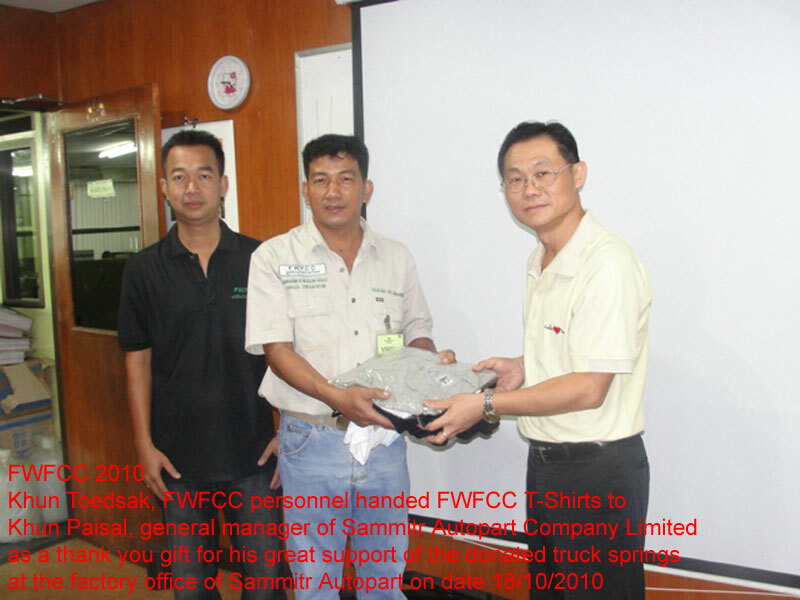 Sammitr Autopart co.,ltd. 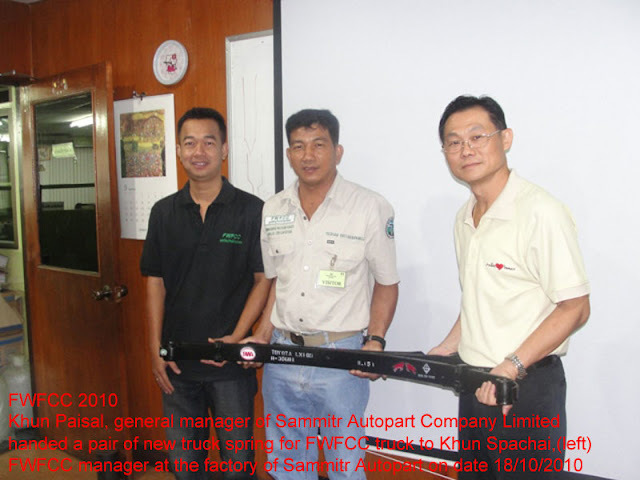 by Mr.Paisal, general manager, handed a pair of donated truck spring to FWFCC, recieved by Mr.Supachai, FWFCC manager at the factory office of Sammitr Autopart which to be installed and replaced the old weary springs of FWFCC truck so that to reinforce FWFCC to carry on its in-field operation of conservation projects in Thungyai - Huai Khakhaeng, the natural world heritage forest and the western forest complex. It's been six years in the planning and design for the final approval of the Namchon Wildlife Checkpoint and for FWFCC to begin the construction work for this immense and important project. 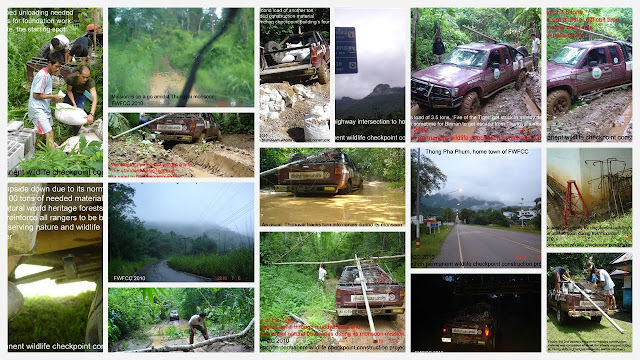 If the Namchon dam project had not been stopped by Thungyai's rangers, several NGOs, Chief Seub and a large public outcry, a huge area of pristine forest inside Thungyai Naresuan Wildlife Sanctuary, (The Natural World Heritage Forest nowadays), would have been submerged under water. Hundred of thousands of creatures & wildlife as well as their uniquely bio diverse and little known ecological systems would have met with great disaster and ultimate destruction more than two decades ago. 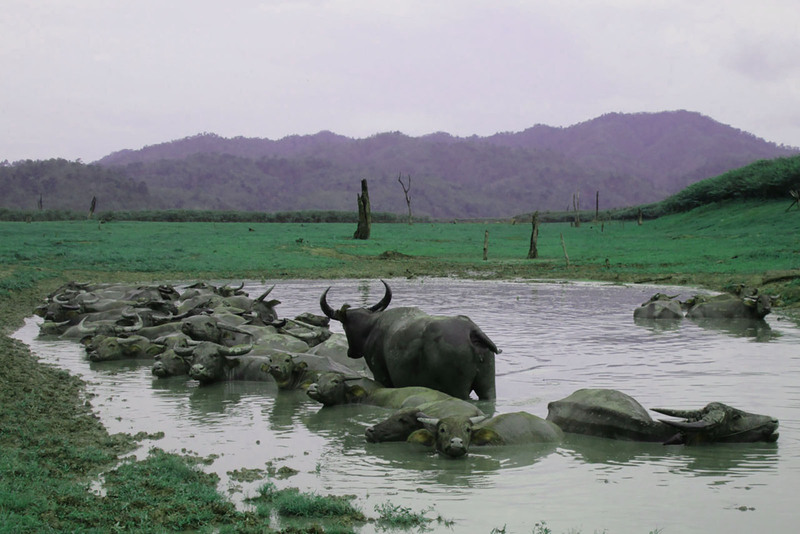 The Aim of the checkpoint is to reduce and minimize the threat of poaching, illegal wildlife trade, and save numerous wildlife within Thungyai Naresuan Wildlife Sanctuary. Many species of animals are on the endangered list with a possibility of extinction such as tigers as well as other protected species like elephants, gaurs, tapirs, bears, great hornbills, etc., Local flora is also better protected. FWFCC has initiated and supported the construction project of the Namchon Wildlife Checkpoint following its consolidated decade approach in constructing wildlife checkpoints both in Thailand’s reservoirs and forested areas. The Checkpoint will further reinforce the Patrol Rangers and personnel of the Department of Fisheries & the Department of National Park Wildlife and Plant(DNP) as well as strengthen the Freshwater Patrol Units. Ultimately the Wildlife Sanctuary will become more efficient in coping with the threat of poaching and the illegal wildlife trade problem. An estimated (15) tons of construction materials were required to complete this project. These materials, from far away locations, were delivered to the construction site near the Tikong Ranger Station during the challenging monsoon season. Our picture stories are meant for all visitors to get some idea of how FWFCC has struggled and carried out this difficult construction project by providing and delivering tons of needed construction materials and supplies throughout its many field operation missions while traveling in “The legendary National Forest”. 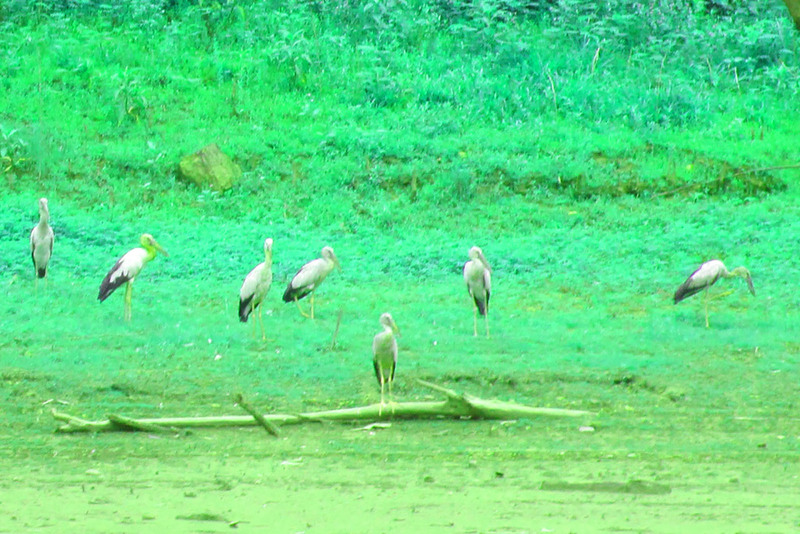 May these photos and comments add to your enjoyment of the beauty of Thungyai's flora & wildlife during the monsoon season, reminding all of us to care more about our fragile, world wide, natural eco systems.